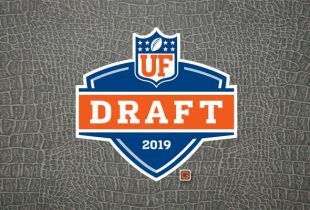 Life has been a whirlwind for former Florida Gators quarterback Tim Tebow ever since his team took down the Cincinnati Bearcats in the 2010 Sugar Bowl. From being the subject of a documentary to changing his mechanics and participating in both the 2010 Under Armour Senior Bowl and 2010 NFL Scouting Combine to making media appearances, hosting autograph signings and scheduling individual team workouts, Tebow has been on the move while trying to figure out where it is that he will actually move to on a more permanent basis in about a month’s time. Saturday, Tebowmania took over Palm Beach County, as the Heisman Trophy winner and two-time National Champion participated in an autograph signing/charity event partially benefiting the Tim Tebow Foundation. Read the rest of OGGOA’s meeting with Tim Tebow…after the break! Before shaking hands, signing autographs ($160) and taking pictures ($75) for the gathered crowd, Tebow met for an hour with members of the Special Olympics and their families in a private area. Tebow’s first autograph session with Palm Beach Autographs, which took place in his hometown of Jacksonville, FL, lasted almost five hours as fans waited and waited for a chance to meet their hero. He stayed past his scheduled time, signing every ball and taking every picture so fans could experience what he once did as a child. His appearance Saturday was Tebow’s second in Palm Beach in three days as he was in town to speak at a Boy Scouts of America banquet Thursday. He returned to Gainesville, FL, on Friday to workout and spend some time with Gators head coach Urban Meyer. Asked how Meyer was feeling and dealing with recent stresses, Tebow gave a glowing prognosis. Between his football duties and promotional appearances, Tebow has a lot on his plate. His going back-and-forth has left him with little time to continue improving his delivery, but he plans to go back and do just that before the draft. Having signed with agent Jimmy Sexton, he has already done some work with Gatorade and is rumored to be the cover star for EA Sports‘ NCAA Football 11 video game. Hesitant at first to answer, Tebow said he has no long-term deals with either company in place, though he is certainly not opposed to them. Part of the reason Tebow is so relaxed with being pulled in every which way is his comfort level with Sexton, who he said is similar to Meyer in that he knew from the get-go the two would have a good relationship. The question now is who will draft Tebow and whether or not he will be attending the 2010 NFL Draft in person in New York, NY. “There are some teams that definitely, when they’re around you, talk very positive around you,” he said. “But you never know what that means. It takes a lot of people to make those decisions so you never know what’s going to happen. I hope he stays home with his family on draft day and does not let the cameras in to show live shots. They will just keep showing him as he waits, same as they would if he were in NY, especially if he does not get picked in the first round. They will make hay at his expense. As usual, stellar job A-Sil. Were you at the event today? Yes. Face-to-face. Good guy (obviously). My parents waited over 6 hours to meet with him. They said he was everything they thought he was, which is pretty remarkable. Today? They must have got there early. I was there today too- got an autograph and pic with him. Awesome experience! I really disagree with what Tim is doing in charging people to meet him for his Herbie Hancock. I know the cash goes straight to a good cause but it is making him look really bad outside of Gator nation and inside if you ask my opinion. This whole” pay me to meet me” is really giving him some bad press….just ask Jim Rome. I know some of you might not agree but just think about the families that cannot afford to pay his lofty meet and greet price. I think Timmy is alienating quite a few people that idolize him. 2bits what don’t you get? Most, if not all of the money is going to help people…kids. Who gives 2 shits what people think?! If there are lines around the corner, clearly the demand is high. 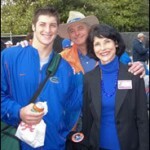 Tebow cares what his God, his family, and the people closest to him think. Why shouldn’t he use was he has worked hard to earn, to help others and maybe himself a bit. Whose side are you on anyways? They got there at 1 and waited till 7:30, they were glad he stayed past 5. They said he was tired but willing to talk. It does seem a little wierd to charge that much, but my parents were glad for the opportunity. My understanding is that he signed a contractual agreement with Palm Beach Autographs, and much of what he earns goes to a good cause. I’m not so sure about Palm Beach AG portion though. If you are interested in going he does apparently shake everyones hand in the beginning even if you don’t want to pay for anything. Chris Leak did the same thing. DP : As I said, people are not going to agree and thats fine, I completely respect your opinion but your not seeing the forests from the trees. It’s great that part of the proceeds raised go to his foundation and I know his intentions are good but there are many families out there that simply cannot afford to meet him and think his decision to charge to meet me is completely uncalled for. If you wan’t to raise money, do a dinner/golf tournament/etc., don’t charge people 1-2 weeks groceries for an autograph when no other athlete does this. Many families are struggling to keep a roof over their heads and free family weekend events are what these families live off of as they can’t afford otherwise. It’s all fine and dandy that you can drop a two hundred spot to hobnob with Timmy and hop back in your luxury car. Just try being a fly on the wall to the homes of the families who have to tell their kids that they can’t afford to go meet Tim Tebow and to stay positive while their classmates talk about how cool it was all week long and these children have to go without. I grew up as the kid without. Unless you had the same experiences, then you have no idea what I’m talking about. No other athlete makes someone bust out a $20 to sign an autograph, they smile, take a picture and sign whatever these kids ask for whether its an arranged even or just in public. I’m will always fight for Tim but am not on his side in him continuing to do this. @Mr2Bits: I understand what you mean, b/c I was really disappointed in Tim for charging so much until I found out that this was to raise money for his charity. Then, there’s the ebay resale factor. If he charged less, or nothing at all, there would be a flood of people lining up to get the autographs & pictures not b/c they were fans, but b/c they intended to sell it on ebay for possibly even more than Tim’s selling them. I still am not a fan of people charging money for autographs & pictures, but there are obviously others who are willing to pay for them, & this is for charity, so I’ve come around to being very much in favor of Tim doing this. He’s going to be able to substantively help a lot of kids that are going w/out a lot more than just pics & autographs w/the money he’s raised from just these 2 events. Brooke : Rule of thumb for athletes is if a fat dude in his 40’s rolls up with 100 head shots and 50 footballs, he is selling them off. If a 10 year old roll up with his kid sized Tim Tebow jersey, then all is well. You don’t need to go to Ebay to see people taking advantage of Tebow because Palm Beach Autographs is taking advantage of Tebow on their homepage. They are conveniently selling his jersey for 800 bucks and charging families an arm and a leg to meet Tim. I love that people are all warm and fuzzy thinking their 160 spot is going to the kids but does anyone actually know how much of the funds collected are going to Tebows cause? I’d venture to say its 50 percent or less. End of the day, I adamantly disagree with what he is doing when families need him the most. Nevermind then…was just a picture of him holding a big check at the event for charity. I’m not going to go back-and-froth with you on this because it is a waste of time and you are looking at it the wrong way, in my opinion. I’ll let others argue the opposition. Just wanted to make a few points. A foursome for a charity golf tournament is ten times the cost of an autograph and picture. Not any more affordable or economical – though I know you are saying the “rich” would be the ones doing that. No one is forced to pay for an autograph, picture or anything of the sort. People could have come out, shook his hand and taken pictures of him on the stage and walking around. It is not a “pay me to meet me” like you said in any way, shape or form. He is not alienating anyone and there is nothing negative coming out of these appearances – which are now over for the short-term. It’s not like he will only sign and take pictures at these events. He doesn’t deny anyone an autograph on the street or in a restaurant or won’t take a picture with you if you run into him in real life or any other type of event – he still does so, happily. The guy stood for a long time after practice signing autographs and taking pictures with kids in Gainesville and donates more time than you can imagine to charity and making people happy. It’s just that for this particular event, to get him to sit down and devote five-to-seven hours of his time to simply be there for the fans taking pictures and autographs, you have to pay. An event like that can’t be free. You either have it or you don’t. It is a win-win for Tebow and his fans: those who can afford it get to meet him in a controlled environment and get a signature or picture from him – and that money goes to charity. If you can’t afford it, oh well, you don’t get the five-hour opportunity to meet him on this one day at this one time. It’s not like he shuts himself off if he’s not at one of these events. Additionally, he is traveling for the sole purpose of pleasing his fans and raising money for charity. He left Gainesville for a day to go to Palm Beach for this reason. Palm Beach happens to be a very affluent area (and the main location of the PBA store). It’s not like he’s doing this in Gainesville, though I wouldn’t be surprised (or care) if he did. Read everything I wrote and put it in perspective. If you still don’t agree – oh well – I just don’t get where you are coming from at all. Again, I am not here to argue, just wanted to give you my perspective of it. Have too much to do today. I had a long drawn up story but am giving up. To each his own.